Hola! My name is Alex. 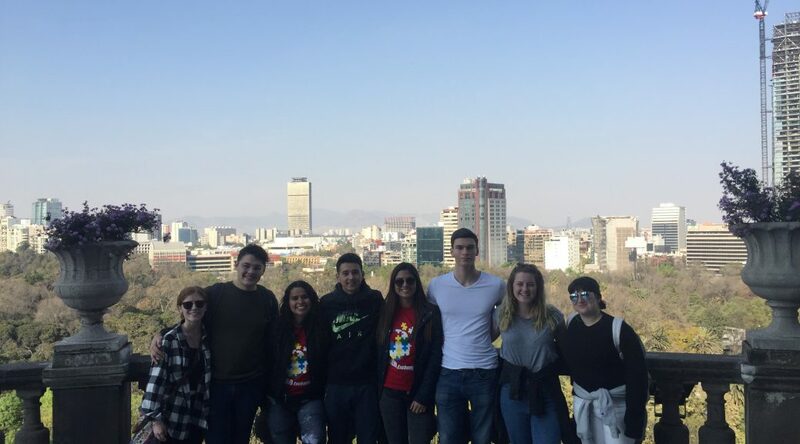 I am studying abroad as an exchange student at la Universidad Iberoamericana in Mexico City, and I am going to start my first blog post with a little bit of venting. I already studied abroad for a semester during Fall 2016 in Heredia, Costa Rica with USAC. This was, by far, the best time in my life, which is why I decided to study abroad again. I knew this would be very different- my program at la Ibero is much more independent, I’m taking classes in Spanish, living in an apartment instead of with a host family, etc. I prepared myself for these differences (or thought I did) but also figured that I had already studied abroad and traveled before, so I felt that I knew at least the basics of how to live and travel abroad. When I got to Mexico, everything I knew seemed to be thrown out the window. Leaving the airport, my Uber driver couldn’t find my apartment. When my roommate and I made it to our apartment, we found it absolutely filthy- apparently it’s not a thing to clean before you move out here. I kept getting stuck places the first few days because I had planned to just use the WiFi on my phone, but it’s not safe to hail taxis off the street here, so everyone goes everywhere with Uber- without a working phone, I couldn’t call an Uber. Getting a Mexican SIM card was one of the most difficult Spanish interactions I’ve every had. In Costa Rica, it’s safe to drink the water; here, I am still adjusting to carrying around plastic bottles and not having water accessible all the time. Even though I speak Spanish, classrooms that echo and professors that mumble make it nearly impossible for me to determine where we are supposed to find the homework for the next class. On the first day of one of my classes, which I really needed to take, the professor told me and a German student that we would almost definitely fail since Spanish is not our mother tongue. My roommate ended up in the hospital with a bad infection and my phone broke during the same day. I have felt wildly overwhelmed more than a couple of times here. Pero, todo vale la pena- all of these difficulties are so worth it already. Despite how many troubles I have encountered and how much stress I’ve had, I can tell this will be so rewarding in such different ways from the last time I studied abroad. There are around 170 exchange students in my program, and only 20 of us are from the United States, meaning I already have friends from all over the world: Central and South America, Canada, Europe, Australia, and of course Mexico. I have been at events where five or six different languages are being spoken, and I’ve picked up a few Portuguese words (Brasilians say “cheers” by making the sound of two glasses clinking together, something like like “ching ching”- it’s very endearing). I’m already picking up some Mexican slang (que padre!). Even though it’s tough, I am forced to speak Spanish almost all day every day, and I know I will continue improving. Everything is so inexpensive here, so I feel quite comfortable financially even without working. My roommates, another girl from the U.S. and a guy from Mexico, are so so so supportive and wonderful. The Mexican people are truly the kindest I have ever met: I haven’t encountered a single person who does not go out of their way to help me with whatever I need and make me feel welcome here. I guess my takeaway is that this is tougher than I expected. I made it through Costa Rica with almost no culture shock, but it hit me much harder this time. I am still so excited to be here and grateful than I am able to experience studying abroad again. I know I will continue to settle into this new life in one of the coolest cities I’ve ever seen. Next time, I will hopefully have more adventures to share and less complaining to do. I can’t wait to see what else CDMX will throw at me!